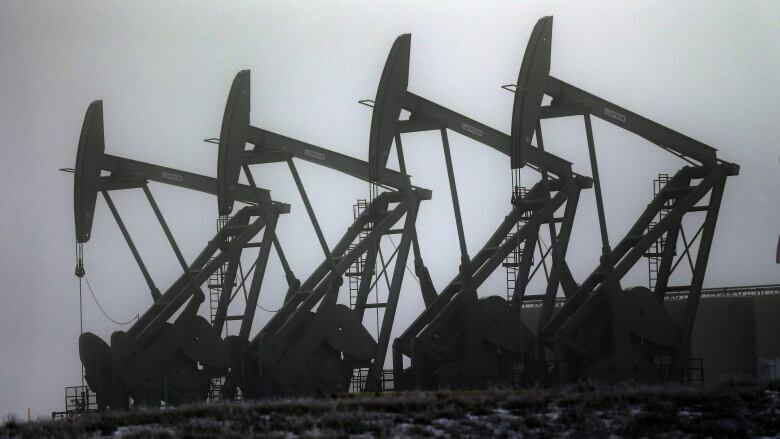 Oil edged below $44 US a barrel on Monday, after another bearish outlook for crude from Goldman Sachs. Goldman said in a research report that oil prices could go "sharply lower" as storage tanks hit capacity, predicting the oil market would not balance itself in 2016. The oversupply of oil worldwide has had storage tanks in Cushing, Oklahoma, at record levels for most of the year. It's not just crude that is in oversupply, but also refined products. "Distillate storage utilization in the U.S. and Europe is nearing historically high levels, following near record refinery utilization, only modest demand growth (especially relative to gasoline), and increased imports from the East on refinery expansion and Chinese exports," it said in its report. Earlier this year, Goldman predicted WTI oil could go as low as $20 a barrel. Research consultancy Energy Aspects points to a similar situation in Europe, with crude oil tankers taking slow routes to their destinations while they await space in port storage facilities. Many oil speculators have been taking long positions in oil, thinking that the market will be balanced next year and prices will rise. But the continued glut is starting to discourage that strategy. Fatih Birol, executive director of the International Energy Agency, is expecting still further declines in oil industry investment in the coming year. Speaking at Singapore International Energy Week on Monday, he said it would be the first time in two decades that oil investment declines for two consecutive years. Traders are also waiting to hear whether the U.S. Federal Reserve raises interest rates after its meeting this week. Speculation that the Fed will not raise rates has pushed down the U.S. currency. As a result, the loonie closed the day unchanged at 75.95 US cents.